Two years of product development, a year of looking for a location and a year of construction are finally behind us! We’ve made four great gluten free fresh pressed hard ciders and are ready to share. 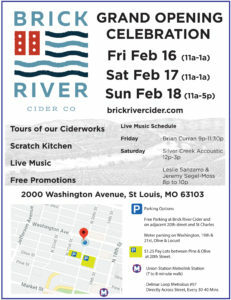 Join us Friday, Saturday, Sunday February 16-18 as we celebrate the grand opening of our tap room. We are giving tours of our ciderworks, cooking off some great food in our new scratch kitchen, live music, prize drawings and more. Detailed parking information and a schedule of live music below.